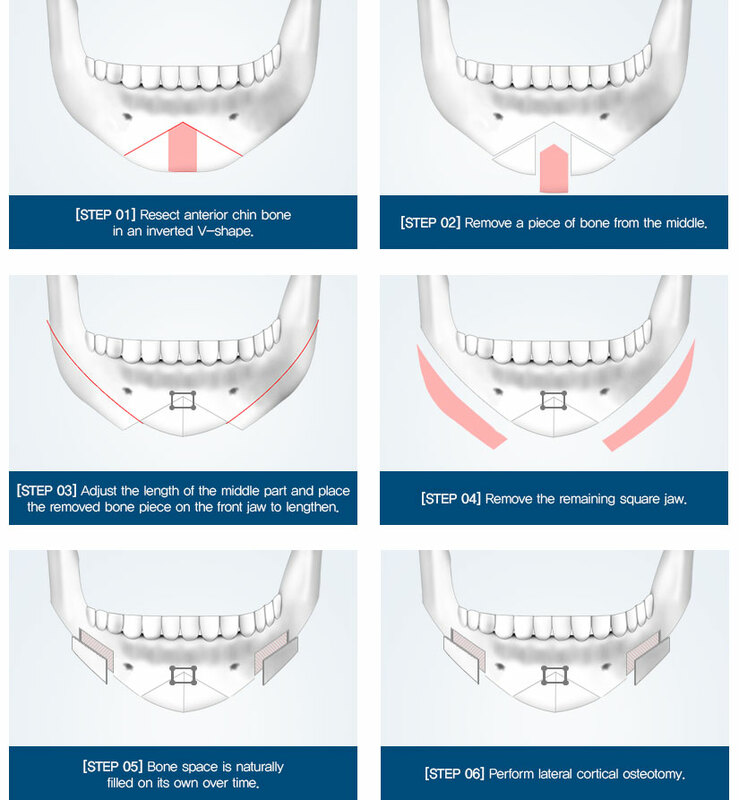 Braun's unique inverted V-shape osteotomy for lengthening allows simultaneous correction of short jaw tips and V-line without implants. 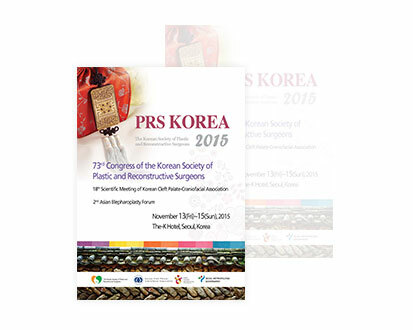 In which was completed after a long period of study with consideration of the length, volumeof the jaw, and harmony with face, the lengthening of the jaw, and V-line surgery are performed simultaneously using one’s own bone without implants. 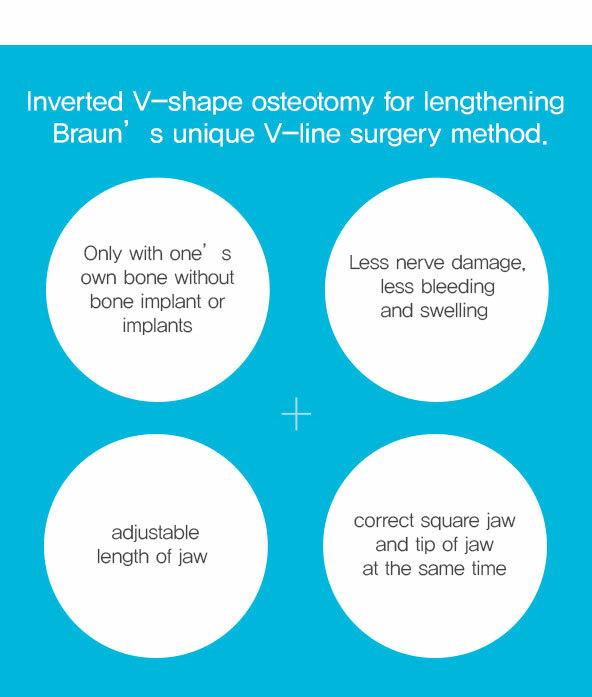 It is Braun's unique surgical method that is safe and completesa harmonious V-line. 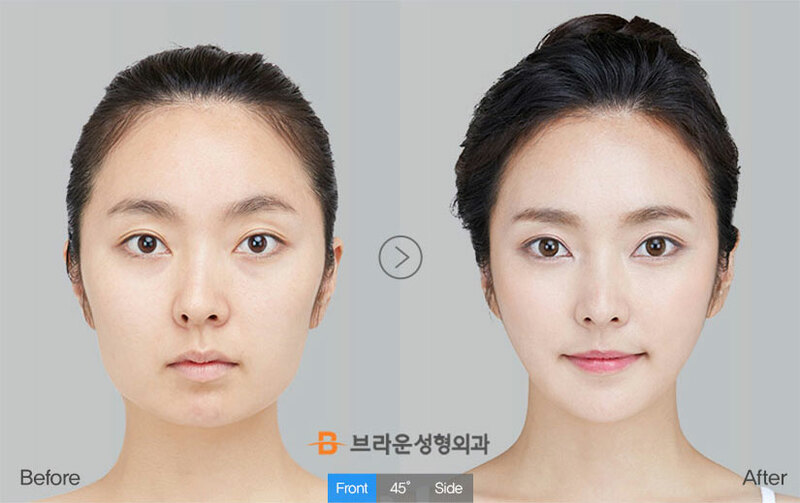 Plastic Surgery Clinic’s facial contouring. [The length of the tip of the jaw can be extended by 2~8mm] Innovative jaw tip extension, Inverted V-shape osteotomy for lengthening. The existing V-line operation methodscannot extend the length of the chin, so additional surgery is performed or an implant is inserted. 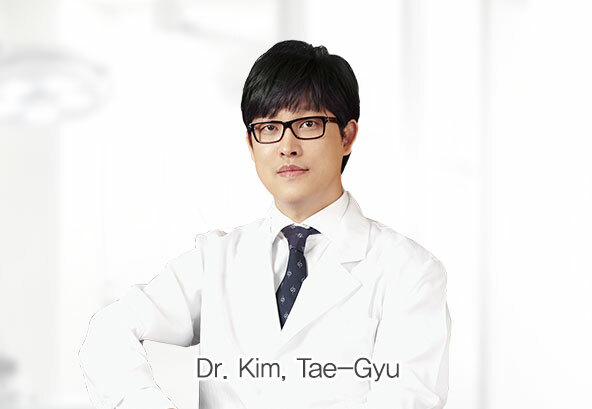 Braun inverted V-shape osteotomy for lengthening is a technique developed by Dr. Tae-gyu Kim, which broke the typical method of a short jaw=bone implant or implant insertion. This made it possible to lengthen with one’s own bone. 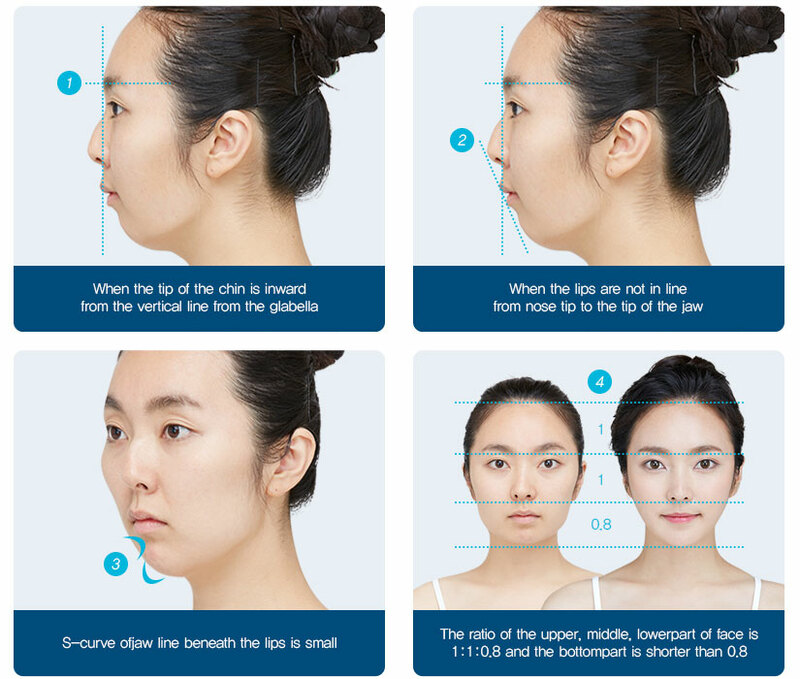 Completing a sophisticated face by adjusting the length of the chin for each individual through Dr. Tae-gyu Kim’s ‘Inverted V-shape osteotomy for lengthening’Chin length and line affect the overall image of the face. 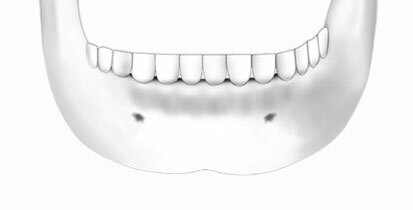 Short and wide jaws are adjusted to the individual without bone grafting or implant insertion, and the perfect facial shape of the V line is completed with a stylish face ratio. Inverted V-shape osteotomy for lengthening results in a safer, more adjustable, more perfectly coordinated face. Extend the length of the tip of the chin to complete a more stylish face. 2. 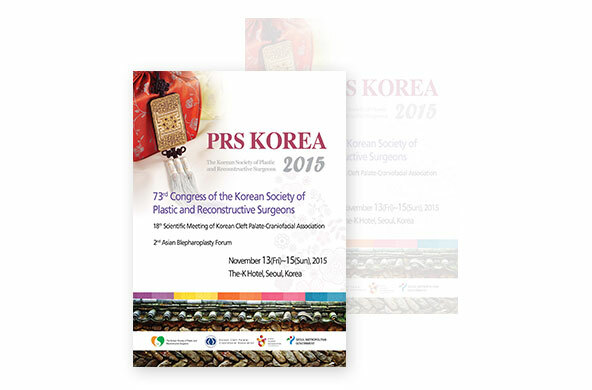 V-line surgery without bone graft + receding chin correction at the same time ! V-line square jaw surgery + receding surgery can be performed at the same time without additional bone grafting, which reduces operation time and the recovery is fast. It is safer since one’s own bone is used for lengthening and there is no worry about side effects from implants. 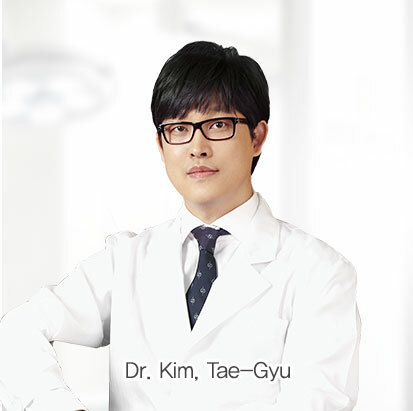 Developed by Dr. Tae-gyu Kim and it is safe and effective without worrying about nerve damage or cheek sagginess. The reason why Inverted V-shape osteotomy for lengthening is special! 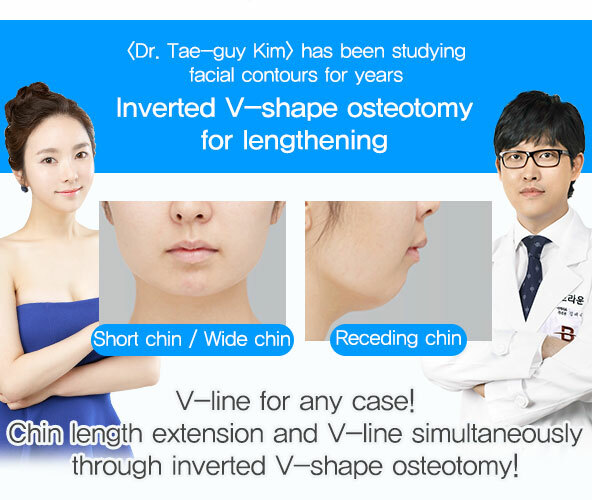 Completing a sophisticated face by adjusting the length of the chin for each individual through Dr. Tae-gyu Kim’s‘Inverted V-shape osteotomy for lengthening’Chin length and line affect the overall image of the face. 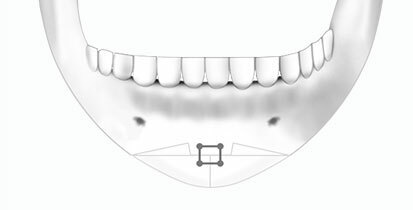 Short and wide jaws are adjusted to the individual without bone grafting or implant insertion, and the perfect facial shape of the V line is completed with a stylish face ratio.